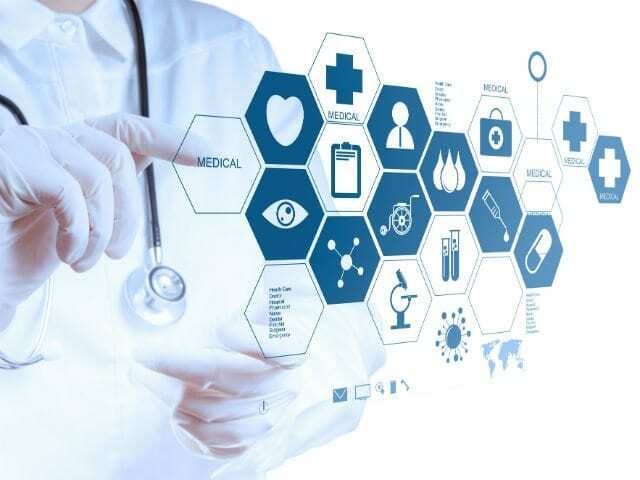 Procurement by Co-Design is a unique program that enables healthcare service providers and tech innovators to work together to procure solutions that solve challenges within the healthcare system. The first session of the Procurement by Co-Design program has now come to an end, so we’re looking back on what we’ve learned so far, plus looking ahead to what’s next. Reflecting on the last year, I remember how the program team felt unsure of whether we’d meet our goals. Even though we developed this co-design process based on extensive consultations and research, you never know how things will actually unfold. Would people understand our terminology? 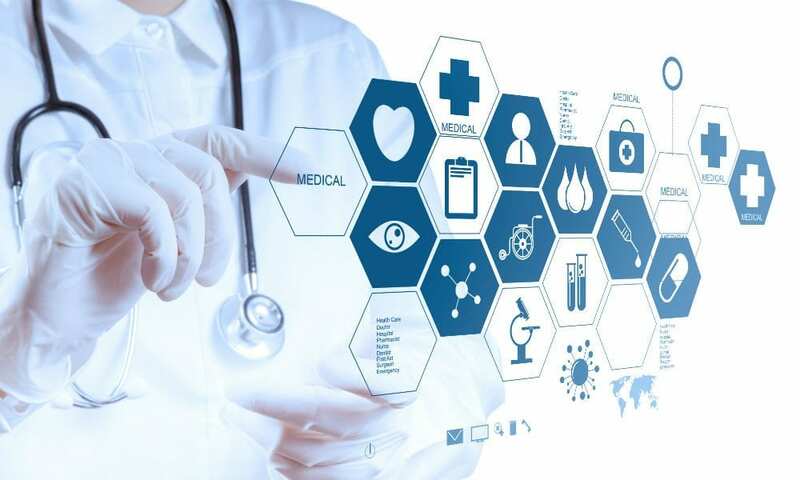 Would the healthcare service providers and vendors get along? Would the participants realize the value of this approach? My anxiety lessened as the program got underway and the value of the approach proved itself at various stages. At our opening workshop there was an enthusiastic vibe in the room as participants ran through exercises together. Later, during our weekly check-in calls with individual project teams, I could feel their optimism through the phone as they shared the new insights they’d gained around the problems they were working on. For service providers, the program acted as a catalyst by providing a pathway to tackle challenges they’ve wanted to address for a long time. For vendors, this was a unique opportunity to really engage with providers and to learn about their needs from a first-hand perspective. During our visits to the project teams with our judges, eager front-line workers told us how empowered they felt when shaping their solutions. In the final weeks, it was remarkable to witness the new friendships and business relationships that had formed between service providers and vendors, and that will extend beyond the program. Some teams have even told us that they are committed to scaling their co-designed solutions together to other organizations. Cohort 1’s journey taught us a lot about how to introduce the design-thinking approach to healthcare professionals and about whether our process was a practical approach to procurement. 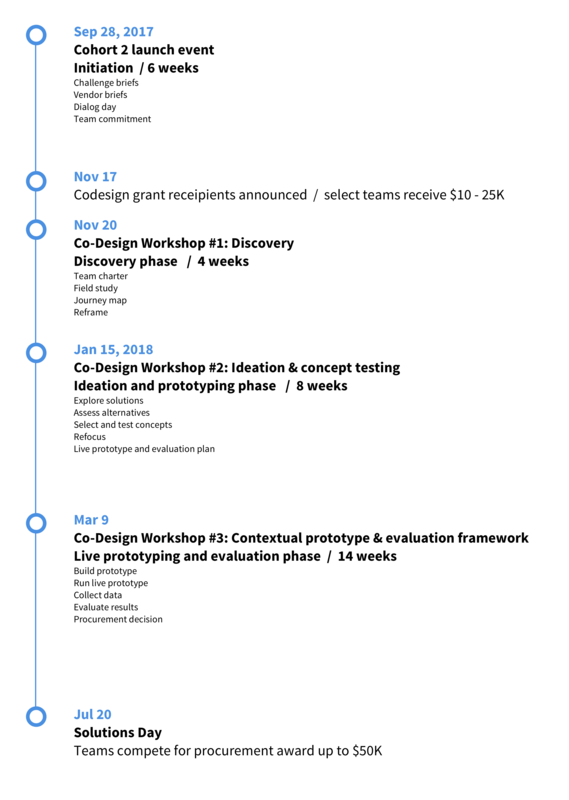 We started with 22 teams on Dialogue Day, but only 17 teams finished the discovery, ideation and initial prototyping phases, and just three teams made it to procurement. In order to understand why five of the teams dropped off, we reviewed their design journals and held debriefing interviews with them. We learned that a couple of the teams dropped out due to funding-related issues; because they didn’t receive the first grant they did not feel encouraged or simply could not continue the project. Others lacked approval from their organizations’ senior leadership teams as priorities had changed, so they lost their project champions. Unexpected policy changes stumped some teams when it was time for implementation too. Before I started working on the Procurement by Co-Design program I was a perfectionist—failure was not an option. The program’s drop-off numbers would have bothered the old me. But my teammates, who have been working on systems change initiatives a lot longer than I have, reminded me that this cohort was a test itself. Our team and the Cohort 1 participants learned just how hard it is to realize the vision we have for the healthcare system. We want decision-makers, procurement officers and project leads to have the confidence to take on innovation partnership methods, just as they would with other procurement approaches such as requests for proposals and requests for services. We learned that there is a fine line between incenting teams to try out the innovation partnership approach and raising the wrong motivations, like funding for pet projects. Each team that dropped out of the program highlighted areas that we need to refine for Cohort 2, insights we would not have gained otherwise. In the true design spirit, we are making adjustments to our plans for the second session of the program based on these learnings before testing the approach again. Here are some of the changes we are making. We can’t change the amount of funding we provide. We realized that if we want to create real systems change, service providers and purchasers will have to take on the co-design approach without our involvement and without grants to offset the cost of participating or purchasing. For Cohort 2, we will be providing grants to teams that are ready and committed to taking on the approach much earlier in the program. We’ll also vet the service providers so that only those that are ready (with funds, senior leadership and committed project champions) will participate. We will also offer more guidance to service providers on how to budget for innovation. This will include exploring new business models such as revenue sharing, payments on outcomes and group purchases. Co-design as a procurement approach is not a panacea for all problems in all cases. We realized that co-design is an approach that is best suited for challenges that are still “fuzzy around the edges”—that is, problems without one definitive cause or one obvious way to solve them. For that reason, we will provide more guidance during the challenge formation and discovery phase. We will encourage more low-fidelity (frugal) prototyping, as well as prototyping in the early stages of the design process. These tests challenge assumptions about users and staff, as well as about workflow processes and information technology systems, and should take minimal resources to create. In these projects, it is easy to become excited about an idea and go straight to full development. We want participants to make decisions based on evidence, even if that means letting go of an idea or strategically exiting. It is challenging to develop products in a limited time frame. For Cohort 2 we want participants to think about creating minimum viable products for the purpose of testing their learning goals so that a procurement decision can be made. This means that teams will have to be more strategic and choose a minimal number of necessary features to test rather than trying to build out every feature they want. We are now gearing up for another test of this refined approach to procurement by co-design. If you have a healthcare challenge that you want to tackle and want to be part of our second cohort join us for our launch event on September 28, 2017, at MaRS. Both healthcare service providers and vendors are welcome. Request an invite by contacting designchallenge@marsdd.com.